As a child, I spent summers on family farms, helping or perhaps hindering with daily chores. If farming was then just a way of life, it is now a sophisticated business with science and commercialism at its core. Farms are getting bigger and dairy herds are expanding. We’re already two years ahead of the agri industry targets in Food Harvest 2020. Proudly, we’re one of the most sustainable milk producers in the world due to our weather and abundance of grass. There are three significant developments in milk production. With selective breeding, cows are producing more milk. Better grass management enables improved and faster grass growth. And restrictive quotas were abolished in 2015. We also know more about the mineral requirements of cows, in order to produce the premium milk that our dairies need for local consumption and for export. The correct balance of minerals aids fertility, milk yield, healthy calving and more. But because our grass is now growing so fast, the natural mineral content needs to be supplemented and sometimes rebalanced. This is currently done by hand and through feed mainly. Given that there is a shortage of manpower in the industry, farmers are run ragged trying to cope themselves. 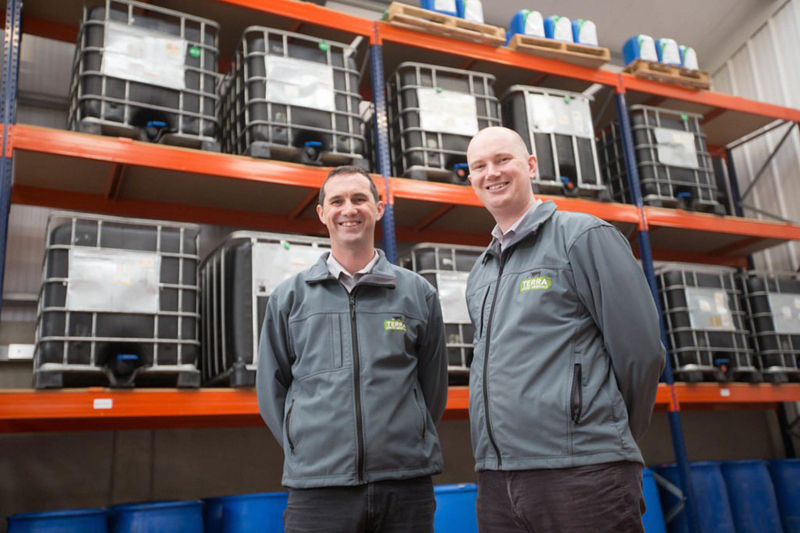 Padraig and Tom Hennessy based in Co. Kildare have a business called Terra Services. They specialize in supplying and installing piping to carry water to troughs for cows in the fields. Their existing piping is an obvious free carrier for minerals, so Terra Liquid Minerals was born. Employing seven local people, they are the only company in the world doing what they do. When they initially engage with a customer, they take blood samples from 10% of the herd and do an analysis of the grass mineral composition. They also take time to understand the herd history in terms of fertility, calving and milk yield. From that scientific analysis, they design a programme of natural mineral supplements to maximize performance. They have a team of technicians calling on their customers every 2-3 weeks, to monitor progress and tweak the mix as required. The business model that has enabled Terra Liquid Minerals to develop and grow profitability so far, needs to change for the next phase of growth. Right now, it is made up of service and sales (of minerals). They are thinking big, so scaling up is their challenge. But the service element is very labour intensive, as it requires a technician to visit the farm about 15-20 times a year. Many traditional industries are dependent on people for reaching global scale. PWC or Hilton Hotels for example, could not expand without skilled people which determines their pace of growth. But if you have a service that can be delivered efficiently and effectively with a tech solution, that is an alternative answer. Scaling up for global reach is quicker, more likely and more cost effective too. 1. Identify the elements within your service offering that can be mechanised with some form of a tech solution. Terra identified an opportunity for remote monitoring of mineral needs centrally in Moone Co. Kildare, through a wifi-enabled controller on the farm. 2. Partner with an appropriate body or team to develop a prototype. To develop their initial prototype, Terra worked with Nimbus Centre (a Research Centre in Cyber-Physical Systems & Internet of Things based at Cork Institute of Technology). 3. Craft a business case to commercialize the prototype. This is where reality has to prevail and where ideas often fall down. Seek help in developing this plan as you’ll need a robust document and presentation if you need to seek external support and/or funding. 4. Even if more costly, get the product made locally if possible. That gives you control and speedy response time in the early days to enable further inevitable tweaking. 5. Consider if you have some IP (intellectual property) that is protectable. I appreciate that the protecting process can take time and you can’t always wait on that to test sales in the market. But be careful before you source production of your product from other territories. I am fascinated by this business. I feel a mixture of nostalgia for my youth and pride in the Irish entrepreneurial spirit that created this concept. I’m particularly impressed that Tom and Padraig are seeing this as a global opportunity and are readying themselves for that. While the controllers will help to determine the mix of minerals to be pushed through the system, Terra Liquid Minerals will also have the capacity to gather valuable data. Think of all the data inputs such as mineral mix, grass and feed composition, fertility rates, calving and yields. This data will help to change the process and the margin in dairy farming forever. That will also change the valuation of Terra. This is an inspirational example for other Irish entrepreneurs. While I appreciate that we have to crawl before we can walk and proof of concept is critical, we need to think big. Scaling up is always the challenge but there may be a technology element to enable it. We have countless clever techie people who are eager to partner with us. Just ask Intertrade Ireland. It is in the tech that you’ll find the profit margin.